If you find yourself looking for some friendly pipe band competition when you’re arm chairing it from your living room instead of out on Glasgow Green then pick one of 8 BINGO cards produced by Llano Estacado (and District) Pipe Band’s own Nick Smith. Each time you hear a particular March, Strathspey, or Reel mark it on your chosen BINGO card. First to get 5 in a row horizontally, vertically, or diagonally wins! 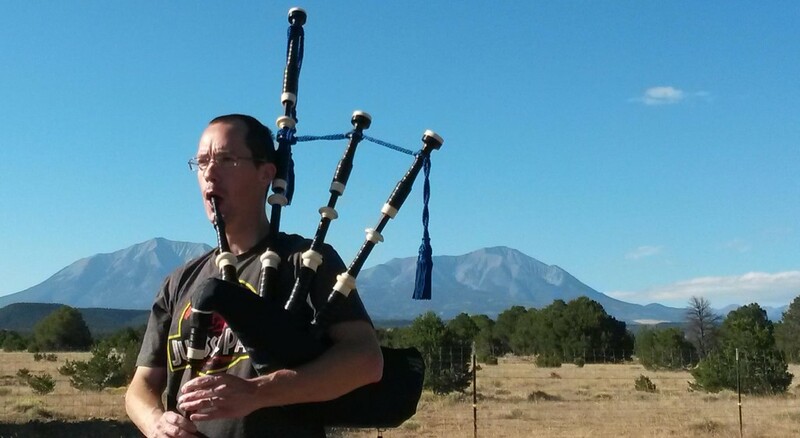 This post is a quick blurb about the Spanish Peaks Piping Retreat held in Walsenburg/La Veta/Gardner, CO (Colorado). This retreat his held as part of the Spanish Peaks International Celtic Music Festival. I attend the SPICMF last year where I attended an all day workshop on Saturday with Will Woodson of hybrid border/uilleann pipe fame. I learned a lot from Will: instrument maintenance, reed manipulation, bellows technique, melodic articulation and variation of style, and a few tunes. In addition to the workshop, there were evening concerts which were spectacular; Ireland’s Full Set was a real treat to hear Friday night and the instructor’s concert Saturday night was great too. I say instructorS because there were workshops for just about everything other celtic instrument during the weekend also. This year is going to be even better! From a piper’s perspective anyway. Here is the official piping retreat schedule. What follows focuses on the highland style instruments, info on the uilleann pipe workshops with Jerry O’Sullivan (!!!) can be found here. Starting Thursday, internationally acclaimed musician Carlos Nunez gets things started with a multi-instrumental workshop focusing on the music of Galicia. Later that day there’s the first concert of SPICMF. Friday sees the start of the piping retreat (with a focus on bellows blown type pipes: smallpipes, shuttle pipes, border pipes, etc; mouthblown versions of traditionally bellows blown instruments are welcome too). The primary instructor for the piping workshop this year is Fin Moore, Hamish Moore‘s son. Hamish and Fin have probably the most famous bellows blown pipe making firm on Earth. I understand Angus MacKenzie of the Scottish band Daimh (“dive”, I think) might be milling about as well. Carlos will stop by the piping workshops before heading off to prepare for his concert Friday night. Carlos played a concert in Lubbock, TX (where I live) for International Bagpipe Day this year (March 10) and that was the best concert I’d ever been to, bar none. That guy has more music in the air he exhales than I’ve got in my whole body. I’d say the trip to Colorado was worth just this concert alone. But it gets better! Saturday, the piping workshops with Fin Moore continue with an additional session in the afternoon playing with the harp workshop participants. I have never played with a harpist, so this will be a first for me. Following Saturday’s slew of workshops is the Saturday night concert with Daimh! Daimh is a Scottish group that incorporates highland bagpipes along with vocals, guitar, mandolin, fiddle, and now uilleann pipes. It’s going to be a great concert for sure. Sunday morning sees yet another workshop followed by the Grand Finale Concert which I’m guessing will be an amalgamation of the instructors playing together, always a delight. That area is a very beautiful part of Colorado. The Spanish Peaks are twin mountain peaks that you can go hiking around. Here’s me playing Jim’s Colin Kyo bagpipes out in Jim’s backyard. Walsenburg is a bit off the beaten path and so if you have non-piping relatives that you’d have to drag along with you (bleh, I know), there are plenty of great restaurants and outdoor activities to partake in. There’s Lathrop state park “just across the street”. I can’t wait to go and I hope to see you there! New drones – what do you think? So a guy in my band dropped off a new set of pipes. I hemped up the drones of his set to fit into my band pipe’s stocks (of Chris Terry manufacture). So the audio that follows is of my band set – the drones + these new drones. I figured I’d knock out a few of our band sets while I was at it. Sorry about the sharp F and flat high A, at times, and occasional cut out. Band chanter is Colin Kyo. Band reed is Gilmour. I used Redwood tenor reeds and an Ezee drone bass reed of some ilk (not the standard reed). The mic was placed behind me since we’re listening to the drones here (I’m a drone guy, what can I say?). The bass drone may be a tad quiet, of course Redwood tenor reeds offer a bold tone without the harshness of other bold tenor reeds, so it may be relative. Both the tenors and bass tune very low down on the mounts. I guess that’s to be expected since the drones were probably made in Pakistan and are therefore expected to be quite flat relative to modern bagpipe pitch (my band chanter tunes to A 482 Hz). Do your ears feel violated now? I kind of do. I just spent 30 minutes recording Pakistani drones when I could have been playing the usual Terry, Gellaitry, Henderson, or Glencoe drones. If you’re wondering, the Colin Kyo pipes are off with Murray getting a refurb and the Jeffers pipes are being played by student; I didn’t sell them ;o). Of course, the original Pakistani pipes were unplayable. The bag looks like paper (not leather! ), the SM-90 knock off drone reeds looked gross, I have enough experience with Pakistani sets to not bother with the chanter, and there ain’t no way in hell I’m going to put that blowpipe in my mouth. Who knows what carcinogenic lacquer/dye they put on that thing. The drone reed seats aren’t really tapered as they end in a hard edge despite being bigger than the bore for a short way up the drone (not enough to get a drone reed all the way up in there mind you, which would be nice since the drones are so flat). Anyways, just goes to show Pakistani drones do work, sort of. After you buy a real bag, real chanter, real drone reeds, and a real chanter reed. Yeah, probably should have just started with a real bagpipe from the get go. Less mucking about, and you won’t feel violated for having gotten them to work and realized you could have been playing a real set of bagpipes the whole time. Once I get a new field recorder (this Zoom I’ve been using for years won’t leave “low” gain mode making it unusable for what I’m about to say), I plan to start uploading audio of my new addiction, bellows blown smallpipes!